My outfit for today isn't too, too exciting, but I've been challenging myself to find a way to wear this blouse.. it's been sitting in my closet all season! The color is kind of hard to work with, but I figured that since it's such a vibrant shade of blue, why not stick with it and have an outfit based on shades of blue? Of course, I had to add some black & white to break everything up and not look like a smurf or something. Also.. I think the time has come for you guys to meet the fabulous Mr. Cuddles. Yes, he is truly fabulous. I've never, ever met a more attention-craved animal in my entire life. We've had him for about 8 years now and I can't imagine life without him! If you just look at him in a certain way, he will start meowing and run over to you to get some lovin! He just can't help it! And when Patrick comes over.. oh my god. He goes crazy! He immediately starts purring and meowing over and over and over and follows him around and sits on his lap! It's so cute :) Also, I don't think the pictures do his size justice. Mr. Cuddles is HUGE. 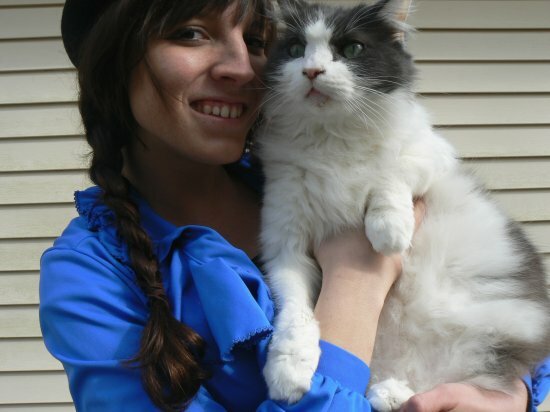 Currently playing: Joe Pug, "Hymn #101"
Oh my goodness, that is such a huge, fluffy kitty, I love! I like how you wore that blouse like a cardigan. So cute! As is that giant fluffy cuddler! Aw, I love Mr. Cuddles! He looks cuddly. 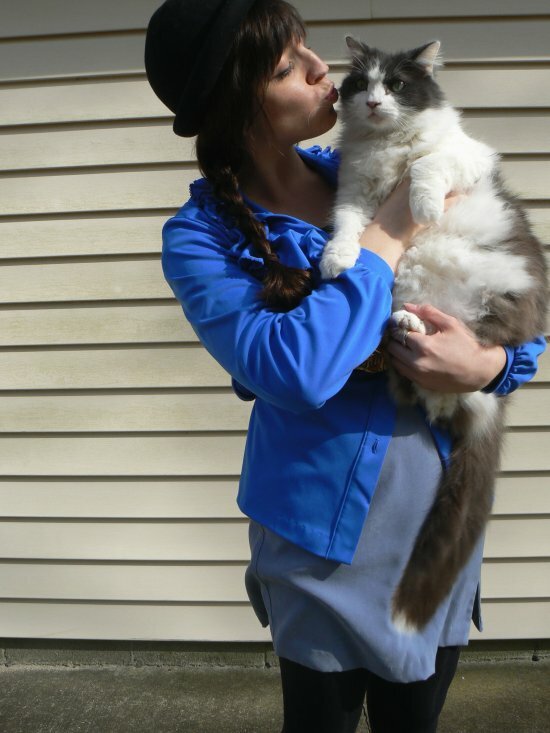 There's nothing like a big fat cuddly cat to cheer you up! I also love the blue shade of that blouse. Really lovely! OMG he IS huge!! But looks so cuddly - if only I wasnt allergic to cats!! beautiful color and ruffle details! you look fantastic! I think you styled it well! I love the hat, stripes and belt. Gorgeous shirt, gorgeous hat, gorgeous kitty! This post makes me smile! ps: love the outfit. the hat is too cute. Awwww, how cute! I would love to have a pet at home but my apartment building won't allow it. 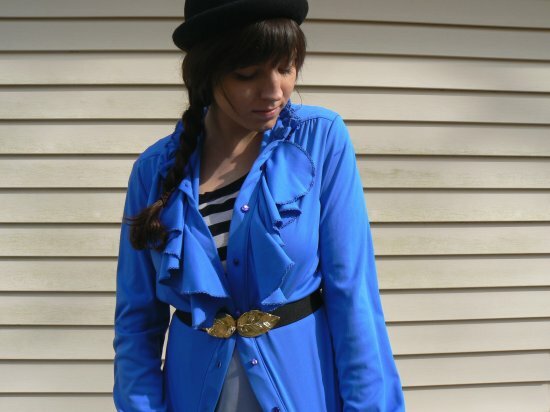 I love that blue ruffled blouse you paired with that lovely belt, too. Loooove the leaves on the belt! What an adorable cat!! I just love big cats. I really like how the belt pulls everything together in this look. And what a fun hat! Aww darling outfit. I love your sidebraid! And Mr. Cuddles is amazing!! I think you did a great job with your outfit! It looks fab and wow that cat is cute!!! What a great name for a cat that doesn't scratch your eyes out! Wow. That is a very large cat! I am totally loving that cobalt blue blouse on you! Gorgeous!